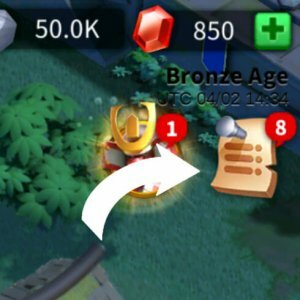 Events are the easiest sources to earn valuable items in Rise of Kingdoms. There are a lot of different Events. They usually last for a few days to a week. When an event finishes, there will be another event replacing its slot and it will come back after couples of days, creating and endless loop of events for everyone in the Kingdom. The Events menu is located at the top right of your screen. Simply tap on it to see all of the running events in game. Each Kingdom Event will be respectively unlocked as the Kingdom reaches new milestones in the timeline. Lohar’s Trial Defeat Barbarians to get Bone Necklaces, which contains a lot of valuable rewards. The Mightiest Governor Competing with other Governors in the Kingdom to finish different tasks and see who is the best! Mighty Army Defeat Barbarians and Train Troops. Warpath Train Troops and to receive the rewards. Lord of War Increase your total troop power to get the rewards. Tiles & Bricks Increase your power by upgrading the buildings. Boundless Wisdom Increase your power by upgrading the Technologies in the Academy. Overwhelming Strength Increase your power by either training troops, building stuffs or researching the Academy. Daily Gathering Gather Food, Wood, Stone and Gold on the Map. Who Will Be Dominant Increase your overall power. Clarion Call Defeat the required amounts of Barbarians. Strategic Reserve Defeat Barbariians, gather resources on the map and Collect loot in the City to receive the Supply Boxes, which contains tons of utility items. Country Themed Event Complete various tasks to receive the event item, which can be exchanged to various items. Karuak Ceremony Defeat an neutral unit called Udor to get the rewards and XP for your Commanders. The more you defeat, the better rewards you get. These are events which do not have any deadline. They are always active regardless of the Kingdom’s age. These Events are generally made for the most commonly holidays like Thanksgiving, Christmas, New Year Event, etc. 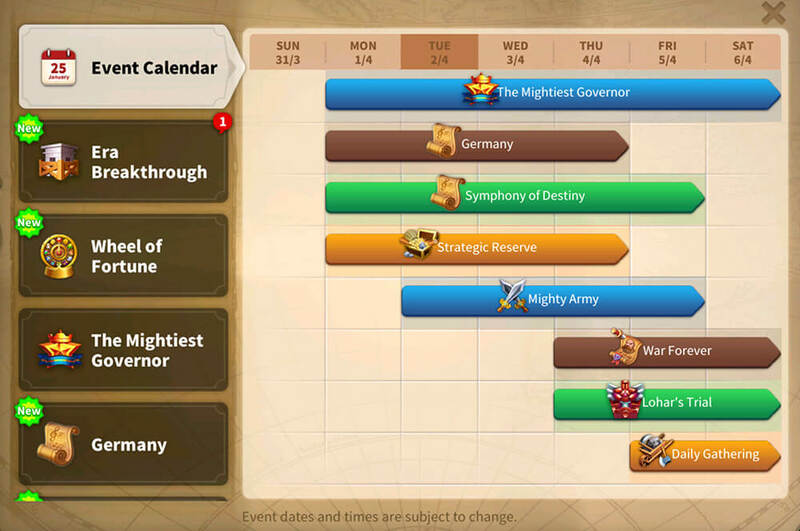 The Event Calendar gives you a quick look at the recent Events in Rise of Kingdoms and also the upcoming ones. This help you work on the Events a lot easier! You will easily know which you should focus on first and how you should prepare for the upcoming events. There will be more Civilization Change Items in the future for sure!